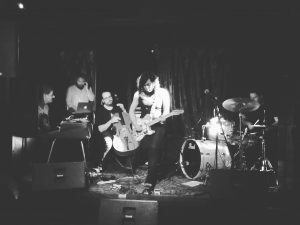 Tangents is a Sydney-based quintet that melds electronic production, experimental rock and free improvisation. Our new album is out now: New Bodies (vinyl, CD, digital album), on Temporary Residence Ltd. Get it on Bandcamp. Also recently released: Stents & Arteries EP (digital only), on Temporary Residence Ltd. Digital available on Bandcamp. Here’s our previous album Stateless, available in all good record stores. Buy from the label! Digital available on Bandcamp. “Tangents artfully mix acoustic instruments and electronics in pieces that combine improvisation with careful processing. At their best, they bring to mind Can, Tortoise, Four Tet, and the Necks.” – Philip Sherburne’s in-depth 7.8 scoring review at Pitchfork. “It’s almost inevitable that this album will incite comparisons to jazzy, electronic-friendly post-rock groups such as Tortoise and Fridge… but it doesn’t seem like a rehash of any particular artist or sound… Stateless is an incredibly refreshing listen.”– ☆☆☆☆ review from Paul Simpson at AllMusic. “…there is a feeling of having been somewhere and witnessed something, even if you haven’t moved an inch while listening to this remarkable, transportive music.” – Scott Wallace at Sydney Scoop. “It’s genuinely, breathlessly exciting and although it’s sometimes hard to tell where the live work stops and the studio fiddling begins, it comes across something like a live rendition of the best of what IDM nutters like Squarepusher spewed out. … this is one of the records of the year, so don’t you miss it.” – Chris Cobcroft at 4ZZZ FM. “The quintet are so comfortable working with jazz, folk music, post-rock and electronic music that the track comfortably hangs in a space between them all.” — FACT Magazine on single “Jindabyne”. “a provocative view of their chosen art form, and a bold soundtrack to our contemplations” – CP Khoo at theMusic.com.au reviewing a live performance at the National Gallery of Victoria. “an exercise in beat-laden serenity” – Treble listing Stateless in their 10 Best Jazz Albums of 2016. “Encompassing jazz, post-rock and electronic music, the quintet played two 30-minute sets of entirely improvised music. It was right up there with the likes of Four Tet – a delight to behold.” – Chris Komorek at theMusic.com.au reviewing a live performance at WOMADelaide, 2017. Debut album I released on hellosQuare (CD) and Not Applicable (digital) in 2013. Live session recorded for ABC Radio National’s Sound Quality in late 2013. Download here, for now. UK/EU Bookings: Phantom Limb, andrew at phantom-limb dot co dot UK or +44 7504 500 907. Australia and rest-of-the-world Bookings: Top Shelf, jordan at topshelf dot com dot au or +61 408 962 319.